ST. THOMAS (CBS USVI) — Big news for the hotel and tourism industry in the Virgin Islands. The Frenchman’s Reef and Morning Star Marriot Beach Resort on track to open in the next two years. The resort which sits at the corner of the busy harbour in St. Thomas has been closed since last years’ storms and visibly vacant. Governor Mapp, who joined in making this announcement Wednesday October 3, said the resort brought in 270,000 guests in 2016 and added $100 million to the economy annually. 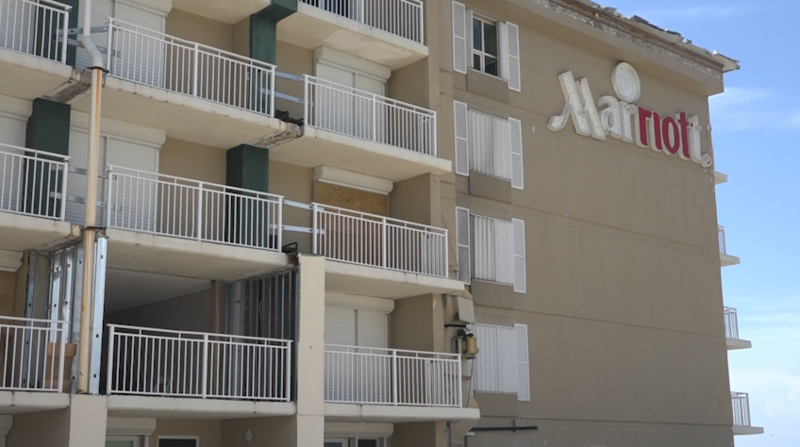 Although there was some question to the resorts ability to make a comeback after the 2017 storms Mapp, owners of Frenchman’s Reef and Diamond Rock Hospitality made certain the resort is returning in 2020. “We have spent the better part of last year focused on how we can come back to the community. We spent an enormous amount of our time and also our own resources to get where we are today. Most of the work we’ve done is sort of in the background. So we’ve demolished, we stripped out the dry wall, and the other things that were wet inside the hotel but we also spent time with architects, designers, engineers, to plan for the rebuild which will start probably in December of this year,” Bill Tennis, Executive Vice President of Diamond Rock Hospitality said to USVI Reporter Kellie Meyer. Although the opening date still far away the governor added the commitment to reopen and rebuild means big things for tourism in the Virgin Islands.